Vi har ingen konfirmanter i år, hverken på familiefronten eller hos nære venner. Næste år står de i kø, hele tre i familien- inc vores yngste. Heldigvis er der ingen på samme dag, så vi når dem alle. til hennes konfirmant, og gæt om! Jeg fik nok så frie tøjler hvad angik både farver og motiv, her er resultatet. Nu håber jeg bare 'kunden' og modtageren kan li' det. Det er 'Vintage Summer' fra Maja Design. Jeg har lavet et Pocket Card, målene er 6x5,5 inch. Teksten med navn og dato er lavet på PC. det var et kompliment! Men jeg kan da godt se at farverne ligner! Motivet er et digistamp fra Saturated Canary, skønheden hedder Pink. Båndet er hjemmefarvet med Distress Reinkere, blomsterne er fra mine gemmer. Det samme er mobilcharmen som jeg syntes passede perfekt. Her er taggen ved siden af kortet. Jeg har brugt mit sædvanlige 'Magi' stempel fra Stempelglede. så godt til en konfirmant, ja egentlig til mange anledninger. 'Stemplet af'. Det skulle måske sidde lidt højere oppe. you're proud of that showcase your own style. some amazing sponsors already lined up. making what you like and tell us what makes it your own style. So...... Do you want to play? will also be holding a DT call on the first challenge. We are looking for 3 teamies to help us have fun! helping us spread the word about our new challenge. Pop over to the As You Like It challenge blog and join in for a chance to win the CANDY. The Candy competition will remain open from now until the end of the first challenge. 2 winners will be selected, and announced on the winners post on the 16th of May. Spring With Buttons, DT card for Stamp and Create with Magnolia. It's time for another challenge at Stamp and Create with Magnolia. SPRING themed image with some buttons on your project. Baseball, Love, Mother's Day, Birthdays. Colors are more bright or pastel. are from Maja Design 'Vintage Summer'. so I dyed it myself with Distress Ink 'Spun Sugar'. I love the curly look. and punched out with my Word Window punch. Oh boy, I was struggling getting that punch. There's no Stampin' Up retailer in Norway where I live! For once on my cards, several flowers and some punched butterflies. They are made out of vellum, and the biggest one is embossed. My usual decorated backside with my personal stamp. Come and join us at Stamp and Create with Magnolia. Link up your creations and link back to us for a chance to win. Bella helping Santa, Mid-Way card for ABC Christmas Challenge. new take on this theme, we want to see them! But don't panic; you still have till next Tuesday evening to link your card. I have used 'Bella with Gifts' from Wild Rose Studio for today's card. You can find Bella here at Stamp and Create, our sponsor for this challenge. Bella is helping Santa with all the gifts. and the sentiment on the banner is from LOTV. I have used Stickles on Bella's hat and two of the gifts. For the snow I have used Liquid Applique. It pops up when you heat it up. and a yellow brad in the center. The backside a bit like the front and of course my personal stamp. For more inspiration, please take a look at the ABC Christmas Challenge blog. My team mates have made some wonderful creations- as always. It's all about the weather, DT card for HM&FMC. Hello and happy Monday, crafter! Are you ready for another fabulous challenge from the HM&FMC team? I hope so and can't wait to see you joining the Fun! Sun, rain, wind or snow- it's up to you what you prefer to show us. image or the wonderful design papers from Bo Bunny. and I'm crazy about the image, 'Holly Sailing'. I have added Stickles on to the snow and Glossy Accent to the berries. And a wintery card was a great excuse to use the dies from Memory Box. with the Memory Box dies on my Cuttlebug. It was for sure a good investment! The backside with my 'Handmade by' stamp. 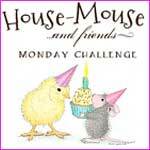 hope that you will hop over and join in with the new challenge at HM&FMC. One Lucky Winner will receive a fab $10 Gift Certificate to shop at HMSTAMPS. Thank You to our wonderful sponsors for your great generousity!! Og tro det eller ej ; jeg nød processen. Jeg har lavet fire næsten ens kort med Henry fra WOJ. og et stempel jeg stadig vender tilbage til. Henry er stemplet direkte på kortet og farvelagt med Distress Inks. 'Gratulerer' stemplet er fra min lokale hobbybutik Hobbyhimmelen. Der er kommet Stickles på kagen. Og det er såmænd det hele! Bagsiderne er helt enkle i blåt eller rødt. dem som fødselsdagskort til sine venner. Og det er et kvalitetsmærke!! H for Holiday Helpers, a DT card for ABC Christmas Challenge. Hi crafters, and welcome to a new challenge ABC Christmas Challenge. So think elves, fairies or someone helping to get ready for Christmas. with both Distress inks and Prisma Colour Pencils on to the card base! So in the future- no need for any design papers !!! 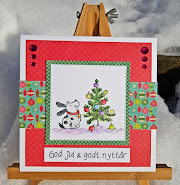 and maybe on my half-way card for ABC Christmas Challenge. but at least he tried, that must count as well. is's such a long time ago since I used them. The design papers are from My Mind's Eye. bulbs in a shop a long time ago, I just had to order them! and on the backside there's only my personal stamp. The sponsor for this challenge is our own teamie Lacey from Stamp and Create. And an awesome prize of $ 25 to the store. over to the ABC Christmas Challenge Blog to see them. Finally Springtime, and GD at Tip Top Tuesday. I think spring is on its way now, the snow in the garden is melting day by day. the answer at this question was......YES! Thanks to the TTT team for asking me. Say It Isn't Sew! - Faux stitching on a card/creation. a perfect choice for this time of the year. would cooperate in printing out for me. from my favourite company, Maja Design. beautiful colours, I think- my favourite. Unusually many flowers on a card made by me. They are a mix from my stash and the leaves are punched out. of what the postman does to the embellishments! visit here will know that I always decorate here as well. I have chosen an easyer way. og derfor skulle han selvfølgelig have et kort. nå at få fat i flere billige monterede stempler. en rigtig skøn serie med flotte drenge/mande-ark. og køllen er lavet blank med Glossy Accent. er småstempler fra Stampin Up. Bagsiden kan vel siges at være relativ enkel. 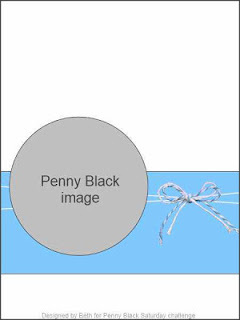 Jeg har benyttet mig af denne sketch fra Penny Black Saturday Challenge.